See The 21st Annual Double Dutch Holiday Classic December 2 in Harlem | HarlemGal Inc.
A reader recently commented on this site saying, how could you as the blogger list all the holiday events happening at Harlem’s Apollo Theater on 125th Street and not mention the Double Dutch Classic? This reader is absolutely right. Major snafu on my part. So I am correcting my error and here is the info. 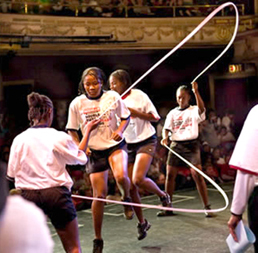 Tomorrow, December 2, the 21st Annual Double Dutch Holiday Classic will take place at the famous Apollo Theater. The event starts at 1 pm and tickets are $22, not including tax or service charge. Click here to purchase tickets. This entry was posted in 125th Street, Community, Events, Harlem, The Apollo Theater and tagged 125th street, Apollo Theater, Entertainment, Harlem, holiday classic, jump roping, The Double Dutch Holiday Classic, things to do with kids in harlem. Bookmark the permalink.